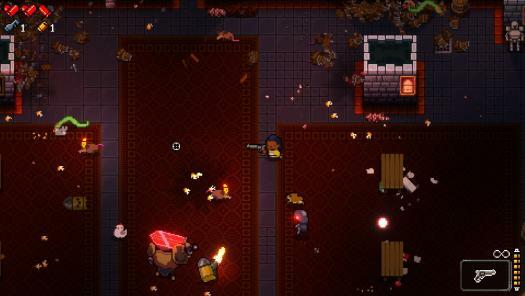 This is a mod for Enter the Gungeon. It requires AG&D or newer version of the game. Please ensure your ModTheGungeon is up to date. Some of the newer AG&D enemies won't be spawned in this mod if MTG is outdated. pots - This mode makes random enemies spawn from pots/other destructible objects. pots_debug - This enables debug output in console regarding names of destructibles being destroyed. 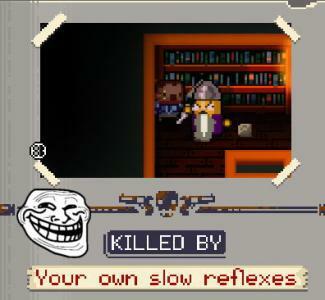 walls - This mode guarantees a wall mimic in every room on a floor. walls_extreme - This mode does the same as walls, but also makes it so more then one mimic can appear in a room. (starting on the second chamber). bonus - This enables bonus enemy spawns featured in Ultra mode. tinybigmode - This enables Tiny/Big enemies. Random enemies can be large or small even some bosses! Normal, Extreme, and Ultra modes enable this option by default. normal - This mode enables both pots and tiny/big mode. extreme - This mode enables pots, tiny/big mode and 1 Wall Mimic in every room. ultra - This mode includes features of extreme but now with an extra bonus enemy that may spawn in any new room of combat. These enemies are more of a challenge then the typical critters you'll see spawn from pots and stuff. Surprise teleports and random pits on floor 2 and beyond! debug - This enables debug information to be displayed in the console regarding walls_extreme mode. reset - This disables all chaos modes. togglehooks - This turns on/off the primary hooks used for modifying enemies or for spawning bonus enemies. Reset does not disables these. They are off by default, but when any mode/command that requires them is used, they are automatically turn on. When you want to go completely back to vanilla, be sure to use this command after using the reset command. glitch - This applies the glitch shaders only to enemies. Please use this command before loading a level to ensure all enemies are affected properly. glitch_all - This applies the glitch shader to almost all objects. Most floor tiles/wall tiles not effected however. For performance reasons, this mode will not apply the shader to the player sprite. Note that this mode may cause FPS dips. Use with care. glitch_randomizer - This enables or disables the random aspect of glitch enemies. Disable this if you want every enemy that spawns to be glitched. glitch_test - This does a one time glitch shader effect on any loaded objects in the room/in nearby rooms. reset - This disables all glitch modes. Some modes may require the next floor to be loaded to fully clear. togglehooks - This does the same thing as 'chaos togglehooks'. Command syntax is mostly the same as old anywhere mod. Use "load_dungeonflow help" in console to get help on how to use this command. Also included is a separate ZIP file containing a version of the mod with chaos extreme mode enabled by default. It can still be disabled via chaos reset like normal. Special thanks to Zatherz, KyleTheScientist, and Abe Clancy for their help in putting together some of the code used in this mod. Please refer to changelog on changes in 1.1+ versions of the mod for any changes in future updates. This mod uses C#. Compile with Visual Studio 2015 or newer. 2. A few new commands added. Use "glitch" or "chaos" to see the sub commands for each. 1. Bonus Enemies now use new code for spawning. (They now spawn using code similar to MTG's spawn command) This should resolve any remaining issues of bonus enemies being stuck in walls. Also expanded pool of enemies for bonus enemies. 2. Added new feature: TinyBig Mode. Enabled with normal, extreme, ultra modes and can be enabled/disabled individually via new console command "chaos tinybigmode". 3. All enemy spawn pools use GUIDs and are spawned via GetOrLoadByGUID now. Updating MTG should no longer be necessary to see all the newer AG&D enemies spawn. Note however this mod still requires post AG&D version of ETG though. 4. Some immune enemies like lead cubes, flesh cubes, removed from bonus enemy spawn pool to avoid potential soft locks with certain room designs. For this reason, 1.1 version of the mod will no longer be available in the file library. 1. Added a couple new commands. Now bonus enemies can be toggled individually. 2. Bonus enemies will no longer spawn in wall monger boss room. 3. Mine Flayers Claymors added to enemy resize black list. Their trigger distance doesn't reflect their new size (the red circle thing that surrounds them). This could confuse players. So they will not have their size altered. 4. Big enemies are now 1.5x larger instead of 1.25 times larger. 5. Grip Masters removed from bonus enemy spawn list. They appear to have improper collision when they aren't in gun form when spawned in this way, which could make it impossible for players to avoid contact damage. 5. Additional enemies added to the Bonus Enemy spawn list. 6. Destructibles on tables no longer spawn enemies. 7. Drums can now have a chance to spawn enemies. Blue drums spawn skusket heads, Poison drums now spawn poisbuloids, and and flammable liquid drums now spawn funguns. 8. Fixed mistake in code that prevented big enemies from having more health then normal enemies. 2. New loot drop system that uses the new supply drop crate system. Now a chance of random loot dropping. Mostly blanks, health, ammo, glass guon stones. But on rare occasion a gun or item will drop. This will help the player out in Extreme/Ultra chaos modes. Loot drops will not occur in Chaos normal mode. 3. 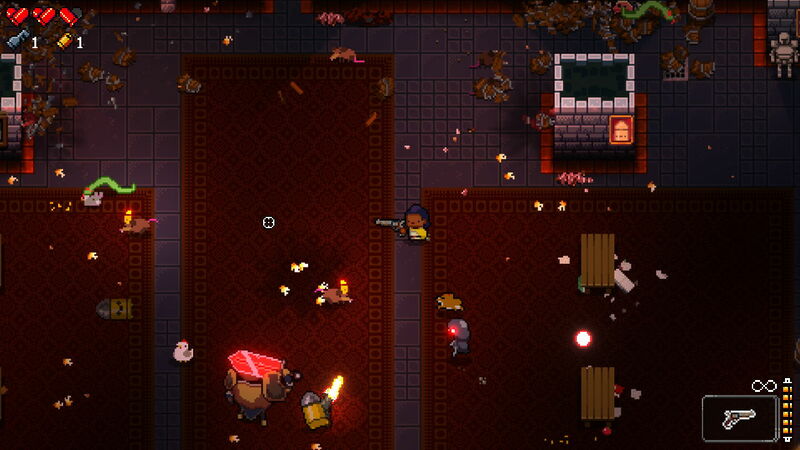 Pot Enemies no longer spawn in the WallMonger boss room in non boss rush game modes. 4. Glitch command removed and glitch sub commands merged via chaos main command. Use "chaos" to see the new list of commands. 5. Auto build of the mod now has glitched enemies enabled by default. 6. 2 new features exclusive to Chaos Ultra and Chaos Ultra Glitch mode. Surprise from teleports that happen twice on a floor. One of which can either take you to a rare room or to a random room on the floor. The other feature is the addition of random pits placed in most rooms starting on floor 2 and beyond. 7. Wall Mimic odds adjusted to make things a little easier. Normal mode no longer boosts mimic odds and "extreme" mode now only has standard one mimic per room for all floors. More then one mimic per room now can only occur in ultra mode. 8. Convicts Past Soldiers, and Robot's Past Terminator enemy moved to the bonus enemy pool. They will no longer spawn from pots. 9. Pots/Destructibles now have lower chance of spawning things with odds increasing on floor progression instead. 1. Pits no longer spawn under teleporter pads and the convayer belts on the Forge. 2. Critters/Pests spawned from pots during Boss fights are no longer automatically killed when Boss dies. 3. Tiny Enemies can no longer be jammed. 4. Enemies spawned from pots no longer count towards clearing a room. 5. Certain enemies spawned from pots/destructibles will be auto killed on room clear. Claymore, bullats, etc. However critters/pests have been excluded from this for now. 6. A few more enemies added to Bonus Enemy spawn pool. 7. A few new commands added. You can now spawn lootcrates on demand and even spawn one with a enemy drop if you want. Refer to new command list via "chaos" main command. 8. Enemies spawned from pots should no longer be jammed. Though code for this may not work correctly yet. Further testing needed. 9. Screen fade code removed from Tentacle Time teleports. It was too buggy and I couldn't get it to work correctly. 13. Tentacle Time teleport can now teleport players to other rooms and the special rare room even during combat. (combat rooms are now properly reset so I don't have to do it on room clear anymore. 14. Further balance changes to make the mod more fun to play. random NPC or chest may show up! 5. Fixed most bugs related to Object Randomizer. 6. Pit Randomizer will no longer place pits on the Forge. This can cause issues with the Dead Blow hammers on that floor. 7. Tentacle Teleports can no longer happen at the same time as a Challenge Time room. The floor will now either have random teleports or random challenge time rooms but not both. 8. Enemies that teleport are no longer part of tinybigmode. The teleport behaviors generate exceptions if the enemy has been resized. 9. 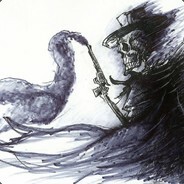 Gun cultists are no longer part of tinybig mode. Same reason as teleporting enemies. The special dash behavior bugs out on resized enemies. 11. Odds of item/gun drops reduced. They seem to be dropping too often on the later floors. 12. Pit Randomizer rebalanced. Amount of pits generated reduced a bit for better balance. 13. More tweaks to Wall Mimic chances to make them a bit less common. 14. A few more fixes/code reorganization. * Added a room in the Hollows to the exclusion list for Pit Randomizer. 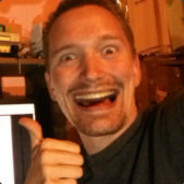 * Removed Sell Pits from object randomizer. They were causing phantom item drop icons on minimap on occasion. * Made the ObjectRandomizer function non static. * Reworked Object Randomizer Placement code. It now caches previously placed objects. This should result in less objects overlapping another object. * Disabled collision for certain objects placed by Object Randomizer. Possibility of NPCs/Locked Doors blocking room entrance/exit ways is no longer a problem. * Added new "Hologram" shader effect to random enemies in Ultra mode. Enemies that become "holograms" can no longer collide with the player. * Disabled primary collision collider of critters like snakes, chickens, rats, robot past critters so that enemies no longer get stuck on them. As a consequence rats and chickens must be shot with a gun to be killed although player no longer needs to worry about them being jammed as they can no longer contact the player. * In Ultra mode, random objects in rooms can become holograms. Excluding certain objects like doors, this results in them no longer colliding with the player. * Player is granted iframes during teleport in tentacle time to prevent damage in certain circumstances like if being teleported while a Forge Hammer is coming down or while on poison/fire goop. * Tentacle Teleport now properly stuns enemies in the destination room if teleporting to a different room instead of only stunning enemeis in the room the player is leaving. * Added console command for disabling explosion nerf introduced by AG&D. Use "chaos fixexplosions" to enable/disable. * Added console command to allow calling Tentacle time on demand. Specifically the version that teleports the player to another room. This may be useful to escape a room in the event an unforseen bug causes the room to not end combat properly. * Some glitch enemies can now have randomized behaviors. They will look extra glitched so you'll know when you will run into one. * The special glitch enemies have a chance of spawning in Ultra mode as well as in any of the glitch modes. * More stuff added to object randomizer. 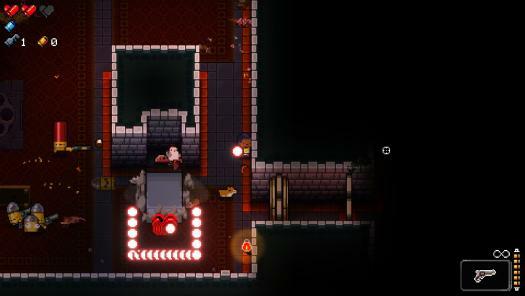 Rat Corpse NPC and rat traps from first phase rat boss are now spawned randomly in the Gungeon. * Added PunchoutAnyTime module. Now you can activate the Punchout Minigame anytime you want! Just type punchout_start to start one. Note that being in a small room/at the breach may cause visual bugs with the punch out fight. If you notice issues, try it again in a larger room. * Spawn odds of pot enemies tweaked some more. * Odds of glitch/hologram shader being applied to random objects has been adjusted. extreme or ultra chaos modes. when you unlock it. May change in future if I figure out how to replace the code it uses to set the target pitfall room. chance that you are taken to a new room besides the creepy eye room. various random attack patterns from a random source enemy. player progress on floor if the pressure plate became a hologram. * Chickens excluded from having player contact disabled. * More stuff added to Object randomizer. * Various other improvements/fixes I forgot about. * Glitched enemies now have chance to spawn a glitched object on death. killed by one of them. prevent potentional soft locks from this. * ChaosKickableObject class improved with some extra null checks. instances will remain interactable when contacting a wall. * PunchoutAnyTime module removed. This will be it's own mod. * Added command to disable explosion queue if explosion nerf is disabled. * Other fixes/etc I may have forgotten about. * Resized enemies now retain their outline sprite. Note that due to reworking on how enemies get resized, enemies in reinforcement waves are no longer resized. This is to avoid issues with Kill Pillars not dropping rewards. * Hopefully reduced/removed the bug that causes Kill Pillars to not drop a boss reward. * A few other tweaks here and there. * Secret floor modified to use the new tileset. Also fixed to work on FTA update. Dodge Roll moved all the room prefabs for Catacombs (internal name for the 4th floor) into the dungeon asset bundle for that floor. So I had to change where I was loading those assets. * Added some code to hopefully mitigate a lag issue the new glitched trap door object may cause if player opens the glitched trap door for the secret floor early during a run on the floor the object appears on. * For balance reasons, All extra wall mimic code has been disabled due to FTA update adding item drops to Wall mimics. I haven't figured out how to prevent this yet, so for now the mod will use the standard spawn odds of the base game and will not increase occurrence of wall mimics in any of the chaos modes. Commands relating to the Wall mimics have also been disabled. * Some of the new enemies introduced for the new floor have been added to Sewers and Abbey secret floors as the new designs would make them a fitting addition to those floors. * Visiting the secret floor will cause a bunch of the new enemies to appear on the Forge and Bullet Hell. Note this is setup to only occur once in a run so once you start a new run, it won't happen again unless you decide to visit the secret floor again.